We are a veteran owned company and proud to say the founder served our country during the Vietnam war. We thank our men and women in the military, and their families, present and past, who are helping protect our liberties, our way of life and keeping us safe. We are forever in your debt!! Thank You For Keeping America Safe! We are also proud to have become the largest supplier of Safety Banners to our Military installations world wide. We ship safety banners to military installations in all 50 states and around the world. YES!!! - We ship APO/FPO ANYWHERE in the World for just $14.75. Thank You for your service and your sacrifice to our country. We appreciate it very much. At the bottom of the checkout page enter your Military Discount Code in the "Corporate Discount Code:" box. If you do not know what your military discount code is, call us at 901-759-0932, Central Time to get your code. To our DLA Thank You Page. 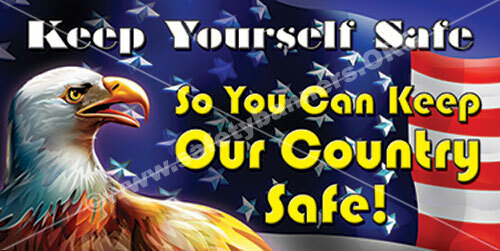 Want a Special safety banner to fit your special need? NO PROBLEM! Give us a call - 901-759-0932, or email us. We can create a special custom banner for your unit or operation at NO Charge for Military design work. (This is for our MILITARY ONLY) Just Ask. Our U.S. military, and their families, are vital to our country and our future - The UNITED States of America. We urge all our politicians to take all partisanship out of their politics when considering our military personnel, and work tirelessly to improve THEIR safety, THEIR family's security, THEIR ability to get a job and earn a decent living once they have separated and most of all THEIR medical care and well being through the VA Hospitals. They have served us, it is time now for us to serve them. The VA Hospitals should be the gold standard to which all other medical facilities are compared. Our troops and their families DESERVE this level of treatment because of everything they sacrifice to keep you and I safe. We all should contact our Senators and Congressman urging them to properly fund the VA Hospital system and our war fighters healthcare needs. Whenever you see or speak to a military person, I urge you to thank them for their service to our country. They deserve your appreciation.